Have you ever thought about what distinguishes a writer from a blogger? The answer may be obvious to you already, or it may not. But as someone who has been blogging for a while and calls herself a blogger, I wanted to clearly identify the similarities and differences between the two terms, to see whether a) they’re interchangeable, and b) which term suits me best. So, the following were my findings? Writing is the form of communication and skill that has been around ever since… forever. It encompasses every form of writing that has evolved through time, and it’s something that we all have the talent and craft to improve with practice. A writer is someone whom I would typically associate with a novelist or writer of fiction, non-fiction, etc. Of course, this was a misconception that undermines the myriad of careers that exist for writers: columnists, game writers, technical writers, translators… the list goes on. What distinguishes someone ‘who writes’ and a writer is the level of understanding, connection, and commitment that the person has towards his writing, I believe. A blogger falls within the ‘writer’ spectrum. With the access to technology that we have today, anyone can enter the blogging word with just a few clicks. But, unlike a writer, blogging is also about establishing a connection with your readers (or try to); it’s a more personal and public form of communication. Additionally, as the majority of us now read all forms of texts, news and articles online, this online makes blogging a more popular option for aspiring journalists, or even writers who want to share their work individually. You’re not compromised to anyone but yourself. With that being said, a writer may also be a blogger, but a blogger is not necessarily a writer. I am not a writer. To call myself one would almost be hypocritical. To love writing and sharing my thoughts and opinions on this blog merely makes me a passionate individual who loves writing as her main form of communication, like many others. I am an amateur blogger. If I were able to step my game up and influence a larger audience, then I would proudly call myself a true blogger. Though I can see that it may appear as if I’m seeking the validation of people to determine what I ‘am’, one of the main reasons I blog is to try to influence people, and until that is achieved, I won’t feel entitled to call myself as such. 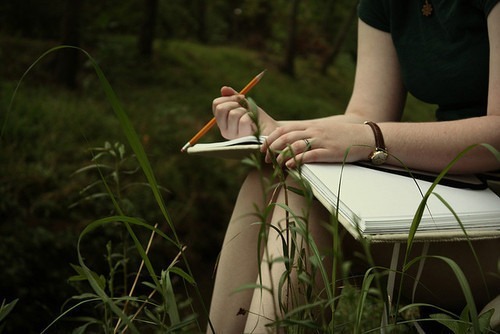 To become a writer, I need to get acquainted with the writing world so much more. Understand the culture. Study different works and genres. Explore the numerous existing forms of writing. Study language. Why do I blog? Because I believe it’s the freest and purest form of writing that I can adhere to right now. There are no rules to how I blog; I decide the rules for yourself. Everything I do and/or want to do I can learn by myself, and I have no compromises nor restrictions as to how I share my content. That’s the fun of it. I am my own creator, designer, writer, and publisher. My posts can be essays, lists, articles, stories, reviews – there are no restrictions. And I love that. I love exploring the limitless ways that I can learn through writing. And this also happens to be the one activity that I know I am absolutely passionate about: the pressure, stress and influence that I had with all my other activities vanish when I write here. Whats your take on this topic? Do you… consider yourself a writer, or blogger, and if so – why?